That wish to pass something on is about the most basic, human and natural instinct there is…That home that you have worked and saved for belongs to you and your family…And with the Conservatives, the tax man will not get his hands on it. Despite being in government for the previous five years, Mr Cameron had been unable to cut inheritance tax. His coalition partners had blocked reform of the current system, of a 40% tax payable on assets worth over and above £325,000 ($ 507,000). But in Wednesday’s budget, Mr Cameron’s dreams may well come true, as the government will lift the middle classes from the shackles of the “death tax”. 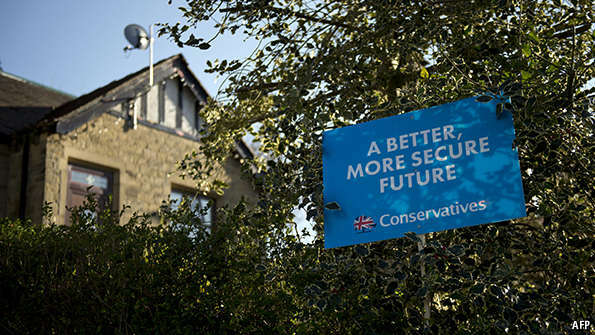 The Conservative manifesto revealed plans to create a new exemption for property, worth £175,000. It would be added to everyone’s tax-free allowance of £325,000, and the total would be transferable between couples. So under the new rules a couple with a house worth £1m would be able to pass it all, tax free to their children. The policy attracted plenty of criticism when it was first announced. A leaked internal Treasury memo commented, “there are not strong economic arguments for introducing an inheritance tax exemption specifically related to main residences.” Critics worried that the exemption for housing would encourage people to funnel even more of their wealth into housing, rather than other, more productive things. They also warned that restricting the exemption to someone’s main home would discourage the elderly from down-sizing. The latest proposals for the policy have tried to solve that last problem. If someone down-sizes and then dies, their tax-free exemption will stay at the value of the house that they sold. This reduces the disincentive to downsize, but may not remove it entirely for those expecting the value of their home to increase. The tweak will be enough for some. Inheritance tax is one of Britain’s least popular taxes. A survey in March by YouGov, a pollster, found that 59% of voters thought the tax unfair, the highest figure for any individual levy. Buoyant house prices mean that under the current system the numbers subject to the tax are forecast to rise sharply, to around 10% of all deaths by 2018-19 according to the Instititue for Fiscal Studies, a think-tank. Arguments against the tax in general include that it discourages saving, and that it unfairly hits the middle-classes more than the super-rich, who can employ clever accountants to avoid it. More fundamentally, critics argue that it interferes with a fundamental right to look after one’s children, and to give your money to whomever you want to. But for others, the cut to taxes paid by the wealthiest will be deeply distasteful, particularly in the context of £12 billion sliced off the welfare budget. There is a strong argument that, while double taxation does disincentivise saving, many London home-owners have not even been taxed once. House value increases from the booming London property market (which had more to do with luck and less to do with home-owners’ efforts) largely escape capital-gains tax. And an outdated council tax system based on 25-year-old property values is extremely generous to those who have seen their properties explode in value. The main argument in favour of some kind of tax on inheritance is that it offers insurance. Through no effort of its own, a child might be born into a rich family or a poor one. By limiting the amount of wealth a child can receive from his parents, an inheritance tax can reduce the risk associated with the lottery of birth. The existing inheritance tax system has its flaws. A better system would progressively tax recipients (rather than donors) of inheritance and would offer fewer loopholes for the wealthy. Ideally it would cover inheritances received over their whole lifetime. But on Wednesday, George Osborne, the chancellor of the exchequer, is unlikely to try to address those flaws. Instead, he will add complexity to the system by reducing the tax burden on an asset that is already given favourable treatment. Britain faces a large fiscal deficit, which Mr Osborne wants to clear by 2018. It is therefore astonishing that while he makes tough decisions to cut benefits of the poor, he will let the wealthy pass on more to their children.